The accession of Ireland, Greece, Spain and Portugal into the European Community was a significant move towards manifesting everlasting peace by means of a single market. The incorporation of these four weaker countries into the European Union (EU) marked a break from the EU’s traditional purview. The paradigm shift of the EU’s approach to enlargement placed Member States onto a path that would harness the full capabilities of a common market in improving civilians quality of life while simultaneously achieving individual Member States’ objectives including growth, employment, and trade. The regional effects of the EU’s single market are drastically different from the effects of the North American Free Trade Agreement (NAFTA). A much newer trading bloc (NAFTA came into effect on January 1, 1994), it lacks the wisdom and fine tuning of the EU. The governments of the United States, Mexico, and Canada signed the treaty1 while hailing how it would “fuel economic growth and dynamic trade, stimulate investment while creating productive partnerships, work for small and medium sized businesses and provide fairness and certainty. NAFTA partners promote environmental protection, and provide greater job opportunities in North America.”2 Yet the effects seem to be the exact opposite. NAFTA has been called “one of the most innovative, astounding documents of the 20th century by the stoic…”3, but this so-called “innovative depth” has reduced barriers to trade and investment, without the necessary checks and balances. For Mexico, NAFTA merely expedited and formalized “the silent integration” that had been occurring since the Border Industrialization Project of 1965— without adding anything new to the table.4 Unlike the EU, NAFTA is a rigid document that has not reformed itself as needed to address issues of border control, immigration policies, and uneven socioeconomic development. In spite of sincere hopes for free trade and economic integration to raise living standards across the continent, the reality is that the unfettered markets have permitted NAFTA to persistently ignore the uneven economic development, and vulnerabilities each country faces. In so doing, the United States has been a quiet bystander to the inequalities proliferating from unchecked free trade. Both countries have been left vulnerable to NAFTA backlash. Mexico’s vulnerability stems from unsound economic development policies and overall slow growth. These factors have increased the US’ vulnerability, to migration. Fed up with uneven development, lack of job opportunities, poor working conditions, and low wages, many Mexicans are taking matters into their own hands and crossing the border, often illegally. Militaristic efforts to “defend” the border have done nothing but increase political tensions and migrant death tolls. NAFTA does not address the immigration problem and its root cause of unequal development. This paper begins with the European Union’s initial experience with enlargements and the experimentation process it underwent to reduce economic and social disparities between regions to further facilitate their single market objectives. After considering how the EU’s cohesion policy strengthened its own single market while simultaneously curbing migration, we present the NAFTA scenario, specifically against the backdrop of Mexico and the United States, in order to highlight the impotent mechanisms the United States relies upon to quiet the waves of economic migrants. The preamble to the Treaty of Rome calls on Member States to minimize regional disparities, but provided toothless mechanisms. The European Social Fund (ESF) and the European Investment Bank (EIB) were incapable of facilitating cohesion. 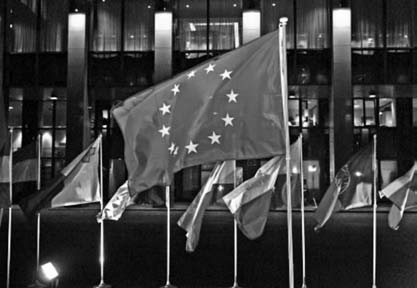 Beginning in 1975, The European Regional Development Fund (ERDF) began to assist poorer pockets in each Member State to redress the Treaty of Rome’s shortcomings. This structural fund helped impoverished areas suffering from various afflictions, such as a decline in local industry or falling commodity prices in an agricultural zone. The downside of the ERDF was that major net contributors were also the major net recipients. The expanding wealth gap which arose from market liberalization became most apparent in the 1980s. The regional imbalances were made starker still with the accession of the Mediterranean countries. Ireland had been on board since 1971, but Greece joined in 1981, and Spain along with Portugal joined in 1986. All are south of what economists have dubbed the “north/south divide” in term of economic disparity.8 Although these enlargements were enacted to further postwar goals and strengthen trade, they held the potential to destabilize the delicate single market. Each inductee was balancing on toothpicks domestically and lacked democratic histories. Greece had just been destabilized by a military coup, Spain and Portugal had just ended dictatorial rule, and Ireland was still afflicted by sporadic violence. They all shared the unfavourable characteristics of low human capital levels, poor physical infrastructure, and low research and development as a percentage of domestic product industry. The health of the single market would be harmed on an economic and political level if Member States failed to bridge the north/south divide. Jacques Delors, the visionary whose name is associated with monumental steps towards European integration9, was a key figure in shaping the cohesion policy in the EU. He imparted a new dynamism into the integration debates when he warned the European Parliament that enlargement negotiations “revealed a tension in Europe which is, let’s face it, a tension between north and south. It stems not only from a lack of understanding, [but] from a clash of culture, which seems to promote certain countries to turn their backs on the solidarity pact that should be one of the cornerstones of the Community, solidarity being conceived as an expression of the common wealth, contributing to the vigour of the European entity.”10 Delors vocalized how disparities limit competitiveness and prevent worthy contributions towards sustainable economic growth for the EU entity. He explained how striving for a “solidarity principle” need not involve a redistribution of resources but rather, a convergence of incomes, employment rates and competitiveness.11 Closing the north/south divide by removing structural weaknesses would strengthen the internal market by creating new markets and consumers. The Padoa-Schioppa Report provided a compelling case for reforming the cohesion policy.12 Its principal conclusions bolstered Delors’ arguments concerning the threats that disparities presented to the single market and money integration13 The report also evinced the political consequences inherent in weak integration. Thus, the Padoa-Schioppa Report was also used by the European Council and the European Parliament to combat the freehand of neo-liberal market principles advocated by Thatcherist economics. The reforms of 1988 transformed the structural funds into effective instruments of development that would aid underdeveloped areas throughout the EU towards sincere convergence. The main three structural funds are the Guidance Section of Common Agricultural Policy’s European Agricultural Guidance and Guarantee Fund (EAGGF), the European Social Fund (ESF), and the European Regional Development Fund(ERDF)- the ERDF being the largest. These funds had budgets doubled in real terms to a total of 60 billion euros by 1993.16 The Delors I package resulted in a transition from short term, project related aid to continual program assistance with decentralized management.17 It introduced new principles, such as the non-substitutability of structural funds in place of state funded public expenditures. This ensures that Member States remain obligated to engage in state-directed public activity alongside of cohesion needs.18 In order to tap into the structural funds, Member States must prepare a clear, concise plan delineating need and the subsequent management actions that will be taken to manage the funds. The final plan is called the Single Programming document; it is the outcome of a negotiation process that tailors Member States’ management of the funds in line with EU goals by outlining actions, objectives, targets, financial resources, monitoring, evaluation and control systems.19 A critical change that the Delors I package instituted was strengthening the existing principles of structural funds. This reform fortified the funds’ ability to work in tandem with one another to achieve five objectives. The synergy of market access, democracy and comprehensive development plans resulted in substantial gains for higher growth, job creation, and competitiveness. The structural funds strove to help countries help themselves. Economic growth due to concentrated benefits, coupled with declining prosperity elsewhere, was considered a failure from the standpoint of cohesional success.21 The structural funds were designed to dilute territorial imbalances and as such, structural effects were assessed in areas beyond economic growth such literacy and quality of life. One notable trajectory was Ireland, which serves as a pivot point to observe the difference in a well-structured cohesion policy’s ability to spur key developmental changes for integration. After joining the EC in 1972 and receiving its first dose of structural funds in 1983, the progress of Ireland has been astonishing. The structural funds provided for the unemployed youth and transportation infrastructure. Between 1986 and 1989, Ireland received 287 million Irish pounds specifically for road investment, since the spurt in vehicle numbers was congesting the commute.25 By 1985, training agencies processed 44,651 trainees in contrast to 13,832 in 1976. The evidence is unambiguous that a combination of the free market principles from a single market combined with managed development aid has raised the living standards and economic competitiveness of the European Union.31 The sustainability and stability of the countries above is represented by the success of the Economic and Monetary Union. Money integration puts countries with differing growth rates under the same currency. Despite these accounts of miraculous improvement and integration for the EU15, it cannot be assumed that the structural funds alone uncovered blossoming economies and domestic stability. Greece only raised its per capita income by 2.4% and remained at 64.3 % of the EU per capita average.38 To this day, it remains at the bottom of the rung. Time has shown that the reality of convergence can only be attained by a combination of factors. Sound macroeconomic policy, market liberalization, foreign direct investment, a favorable external environment, public willingness, low levels of corruption and a strong rule of law are necessary components to release the full potency of cohesion.39 Structural funds are often thought of as the base point for sturdy and sustainable growth; an integral piece of the virtuous economic circles liberal markets can bestow. The OECD’s position that “Catch-up is not… a spontaneous process, but depends very much on the degree of development of market mechanisms and the quality of social and economic infrastructures” aptly applies to the underlying logic behind the long-term processes of the cohesion policy.42 In the case of the EU’s enlargement process, single markets have been the bones, while development aid has been the nourishment. The largest trading bloc worldwide has benefited most from human capital and infrastructure development- two programs out of the smorgasbord of projects ranging from tourism to research and development to food product marketing to equality in labour markets. Razing socioeconomic disparities abated the pull factors for economic migration. As evidenced, the effects of managed capitalism go beyond the conventional notions of equitable wealth distribution. Liberalized markets cannot provide blanket public goods because it’s not profitable for individual investors. From the development angle, the cloned solutions that the “Washington Consensus” prescribes cannot provide individualized attention that a struggling economy needs. To Jacques Delors, the medium for cohesion was synchronized development aid, sustainable self-help, not simply throwing money at the problem.43 The European Union allocated a total of 195 billion euros for the Structural Funds from 2000 to 2006, which accounted for roughly one third of the Community budget in 1999 prices and is 0.4 % of the EU GDP.44 Humanizing rabid market growth is clearly attainable. Why then does NAFTA show such a drastically different results? America sold the idea of a single market to the public, saying that it would be the fulcrum for economic and wage convergence, a shining star for the world to emulate as living standards across the continent would rise due to increased growth. 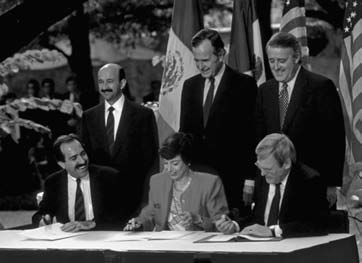 NAFTA’s true ambition could never have been a single market – the written agreement does not even make mention of Mexico as a consumer market.45 Rather, the agreement was designed to support a crude form of free trade so that investment could expand with minimal constraints, with Mexico being an appendage for corporate needs. NAFTA’s misaligned priorities flung an ill-equipped Mexico into an arena of unrestrained market liberalization, unarmed with the resources necessary to compete against global multinationals. The dexterity of change from the “bloodless revolution” that NAFTA spurred, has hurt the embryonic stages of Mexican democracy by concentrating economic wealth in the hands of a few and disenfranchising the “have-nots.” The ramifications of marrying democratic voice to economic prosperity further masks the harsh suffering of affected Mexicans.46 Moreover, by choosing to ignore the deep rifts between Mexico and the United States, NAFTA architects have created a situation in which many Mexican citizens have no better options. Only leaving their homeland portends a better future. The trade agreement dropped agricultural barriers to increase the free flow of farm goods. What was detrimental was how the U.S continued to over-subsidize crops and protect its domestic agriculture, while the Mexican government withdrew historic protections such as tariffs and subsidies to be in step with neoliberal standards. These agrarian reforms rendered Mexico’s traditional farming methods useless against American mass production techniques.47 Mexico’s already fragile market riskily opened itself, while the already over-protected American market remained closed, leaving Mexico at an even greater disadvantage. The border industrialization region is fair evidence of NAFTA’s failed promises. The peppering of maquiladoras are a cursed blessing, where desperately needed work is adjoined with harmful living conditions. “The lack of health and safety standards, pollution in surrounding areas, low wages, and tedious work are parts of the destitute whole that is life working in the maquiladoras. Only poverty stricken human beings accept these inhumane conditions and only because they have no power to better their lot.”48 In these maquiladora border regions NAFTA requirements prevent Mexico from taxing anything except for value-added taxes, yet tax revenue is essential to fuel a development agenda. Residents are powerless against the multinationals and their desperation for work unwillingly renders them more subservient. Deregulation can be highly beneficial as it trims the fat from bureaucratically burdened markets. However, when it goes past a certain threshold, deregulation becomes nothing more than a cost shifting measure.49 For instance, allowing industries to deposit toxic waste with minimal costs subsequently causes a rise in costs for the city. Indirect results are further costs to health and quality of life. Transnational companies do not pay taxes, so who will cover these mounting public costs? The Mexican workers living hand to mouth simply cannot. NAFTA has failed to curb illegal immigration because negotiations were not crafted to promote a rise in living standards, health care, environmental cleanup, and worker rights in Mexico. It has not had a neutral impact, but has destroyed sectors of the economy and undermined public welfare policies. Ozenen, Cem Galip. “The Effects of Structural Fund on Ireland’s Development and Lessons for Turkey” General Directorate of Economic Sectors and Coordination Department of Infrastructure Services. State Planning Organization. May 2006. Verdun, A. “The Role of the Delors Committee in the Creation of EMU: An Epistemic Community?” Working Paper RSC No . European University Institute. November 1998 98/44 http://cadmus.iue.it/dspace/bitstream/1814/1596/1/98_44t.htm.>. “Economic Sectors and Coordination Department of Infrastructure Services.” State Planning Organization. May 2006. Bagavos, Christian “Quantitative aspects of migration trends in Europe,with an emphasis on the EU-15” Department of Social Policy and Social Anthropology. Panteion University. February 2004 <http://www.oif.ac.at/sdf/sdfpuzzle02-04Bagavos_final.pdf>. García, María Cristina. Seeking Refuge. Berkeley: University of California Press, 2006. August 2001 assessment on the INS Southwest Border Strategy.